After listening to this album, my first question is – Who got divorced? I think this album is one that a lot of people can relate to on an emotional level. I highly recommend it if you like emotional music, albums that tell a story, danceable tunes, songs that will fire you up and break your heart, or if you simply love Train. 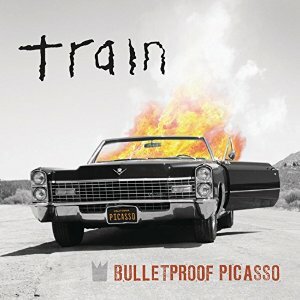 Train has borrowed styles from many different artists and effectively pulled it off. I am very impressed with their versatility. Let’s go through each song! Cadillac, Cadillac – The beginning of this song reminds me of an older Police or Sting song, and has a fantastic beat you can dance to. Angel in Blue Jeans – I recognized this one from the radio immediately! It’s got a bit of a country feel, which is not my favorite, but I do enjoy this song on occasion. Give it all – This has a marching drum that propels the chorus. A haunting falsetto sings “I have a lot, maybe too much, but I’d give it all for one more night with you.” When you work as hard as artists have to do to continually be in the public eye, it is hard to stay connected to loved ones left at home to continue the day to day life that has to go. It’s no wonder that celebrities don’t last very long together in relationships. A minute out of the public eye means you might be forgotten. I think this can apply to anyone that is apart in a relationship – maybe serving in the military, or driving trucks across the country, or in a long distance relationship. Unless you make great efforts to stay connected, it’s easy to lose yourself in new experiences. Wonder What You’re Doing for the Rest of Your Life – I’m not a big fan of this one for reasons I can’t pin down. It just doesn’t speak to me personally, and feels a little bit campy. It’s a cute song though. Son of a Prison Guard – I love listening to the story in this one; it’s a story that anyone can relate to.The song is mellow sounding, but not too syrupy. It’s got a gentle dance beat. Just a Memory – The words are sung in a rhythmic style. The style of this song reminds me a lot of Maroon 5 during the chorus. I’m not particularly captivated by this one versus other songs on the album. Maybe during radio play, I’d enjoy it more. I’m Drinkin’ Tonight – this one has haunting guitars starting the song off in minor 7 chords, and I immediately like it. “The only thing stronger than you is whiskey.” I can understand the need to dull pain. We’ve all been there. I Will Remember – This song will break your heart! Haunting guitar licks play between the lyric lines, pulling on your heart strings even more. The Bridge – You want to move your feet to this song for sure. This one has an R&B feel, and gritty, emotional vocals. Baby, Happy Birthday – “Don’t you think that I wish that I could be somebody else sometimes, someone that would not forget your birthday.” Ouch. Yeah, that’s pretty bad. It has happened to the best of us, but still, that’s pretty awful. Has someone ever forgotten your birthday? Don’t Grow Up So Fast – Acoustic guitar opens this song, with lovely vocals singing a simple melody. At first, I wondered if he’s singing to his daughter. But following the rest of the album, I wonder, is it his ex wife? I’m hoping daughter. It’s a beautiful song regardless. A solid tune, with 1970s style piano in the background. Don’t forget to watch Train’s live performance on the QVC channel on Friday, September 5th at 5pm ET. If you want to get the album for yourself, check these links out!